Startups were farmer's boots, this pair made for me in the UK. 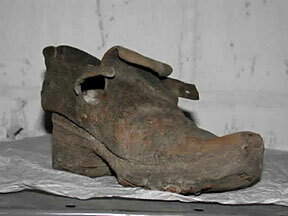 1650's Latchet found in building, note thick sole and stacked heel. A modified pair of $10 leather oxfords from Payless Shoe Source compared to $140 hand-made latchets -- guess which pair fits? Hand-made latchets are the best choice, but can cost over $150 from US makers . Don't buy new desert boots -- you can get custom shoes made for nearly the same cost. 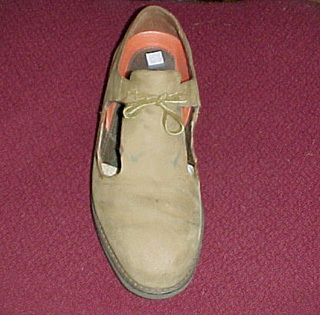 Shoes for conversion should have plain toes -- no moccasin toes, toe-caps or other seams. And soles should be flat and dark-colored, no Vibram or lug-soles despite the fact that many shoes have these non-period-look lug soles. 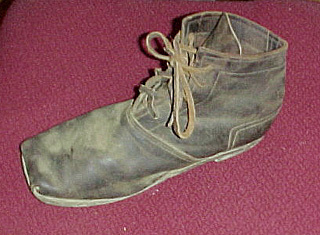 If you can find used square or round-toed "harness" boots, desert boots or hushpuppies or anything similar for a good price, consider cutting the sides to make them look like latchet shoes -- the shoe of choice for the English Civil War soldier. Despite what you may see in movies, bucket-top boots were worn mostly by officers and cavalry. Low shoes were a fashion statement, and only hicks wore startups. 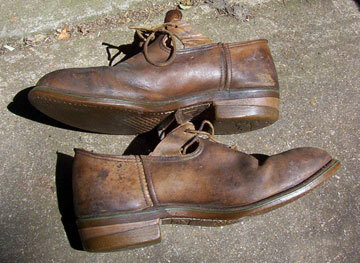 Check the charity shops for all-leather shoes or low boots. Get them at least your correct size, but if they are a size or two larger you can wear heavy wool socks and/or add a thick innersole. Try to get shoes with dark or tan soles -- red rubber can be difficult to color. No lug soles! 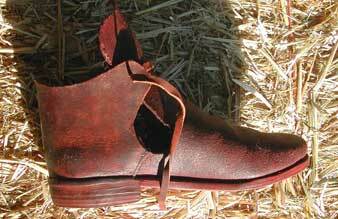 You don't have to trim holes in the sides of the shoes -- latchets were often made with closed sides. 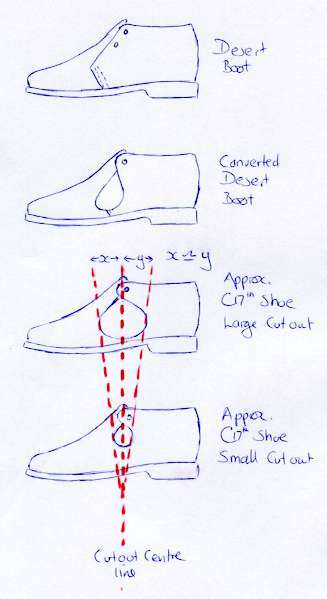 Trimming the shoe is easy. Get a strong pair of sicssors, trim back from below the top lace-hole towards the side-seam in a circle. Curve up toward the bottom of the tongue so that the remainder of the leather flap with the lace-holes is removed. You may have to trim back, remove, or color the lining if it shows in the cutout. As you can see from the startups, square toes are period, but finding anything other than used boots with square toes is difficult. 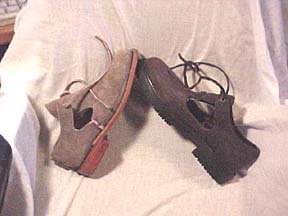 Another trick is to buy a pair of "harness boots" with square toes and the faux spur straps, then cut the straps and top off to make a nice latchet shoe. Be sure you have several pairs of long stockings -- Jason Townsend & Sons have the best selection. You can wear a second pair of short heavy wool socks over the stockings, and turn their tops down over the shoes for a comfortable, period look.